So I received so much amazing help with my lounge, I thought if try next with my bedroom. Basically I need some help with curtain, duvet, throw and cushion colours. Plus any other suggestions/improvements anyone recommends. I can't post any actual pictures of the room as the builders are currently there so I've added the first picture to show the room layout. Essentially three walls are white and I'm adding a feature wall in the wallpaper picture I've added. 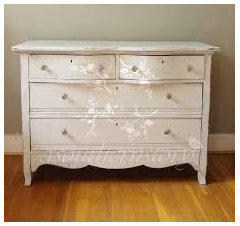 I've also added a picture of the bed and of the chest of drawers I am thinking of buying. 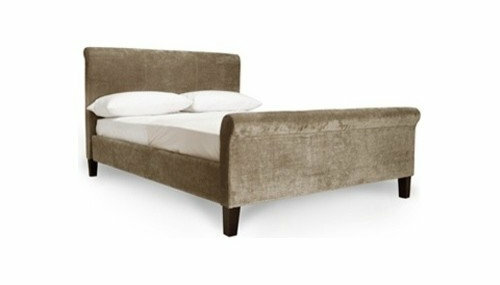 I haven't bought these things yet (except the bed) so if people think the chest of drawers, for example, wouldn't match the bed or wallpaper please let me know. Currently the colour scheme is white and grey but I think the room will definitely need another colour, maybe sage green? 'and so this is where I need all your help as I really don't know if I should have the curtains, duvet etc in the same colours or different, or even if the green would clash? I also don't really know what style I'm going for so I don't know what shape side tables I should be looking for? Maybe french style, I don't know. You mentioned sage green, do you like any of these? The furniture and wall paper are lovely. You think the purple is too close to duck egg?  I get greyish light blue, slightly greener light blue and a greyish navy. No purple. Possibly what the OP is seeing too. Of course it could be my ipad settings! 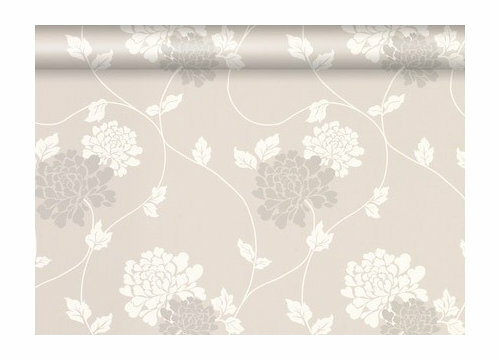 just seen this on TK Maxx website, and google, are the colours similar mefor? What a shame, they're such pretty colors. 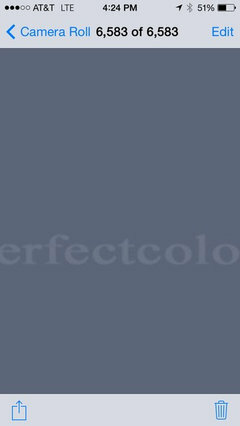 The other is a darker gray purple and the other is dulux duck egg. If there's a moratorium on blue at the opposite, then at the quarters we have the sage green you were talking of, and a heather. Saying that, I think if you work with the darkest shades of the bed like I've done in my mood board with the curtains, rugs and accessories, then you will have no problems with the room being a wash-out. Yes. Jesse I think so, can't get link to load. That's quite similar to the light one. A very calm pale purple wash.
Should i use grey curtains or in one of the accent colours! That's entirely up to you jessa! the 60-30-10 rule that OnePlan was talking about earlier doesn't have any rules on which colour should be at each percentage. Curtains would be a good way to use it for the 30%, or just keep it to cushions and ornaments for the 10%. sure, its my mothers room, she is 82 so it had to incorporate her own things too. Your wallpaper will make the room a reverse but similar. It feels lovelier in real life than in the photo. Your colours choices are even more modern, and perhaps more chic, gorgeous. I think its worth remembering, as the clever ladies here have taught me, that accessories can be a colour to add to the room. Beautiful glass perfume bottles, a mirror , vase or photo frame, watercolour, or cushion. 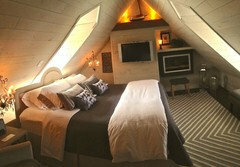 Keeping to the colour scheme at the top will be restful, and pretty lighting will give it a glow. Have you got bedside lighting? cross post, the lavender is lovely ! what colour is your wardrobe? I have very similar colours in my bedroom - my bed is a fudge/mink colour and I have mirrored bedside tables and a mirrored dressing table. 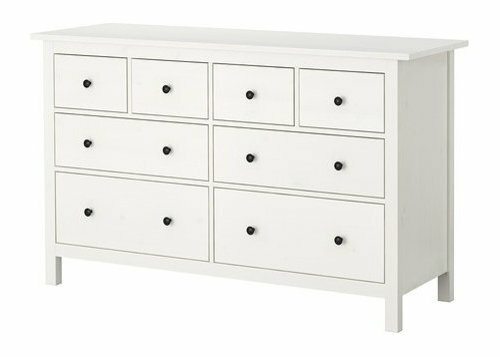 I'm planning on painting my Ikea Malm wardrobe as I hate the oak colour but not sure yet which colour to paint it. I definitely don't want to paint it just plain white. I want it to look different. I would love to paint it a pale grey but I don't think it will go with my bed and curtains. My curtains are an antique gold well that what the name is but I think it's more a mink colour so a similar shade to my bed. Nooooo you're not butting in at all, I need all the help I can get, so you mean matching the other three walls to the wallpaper? And ha78 your room sounds so pretty but unfortunately I can't offer any suggestions but good luck! Would these side tables go with everything else in the room? The chest doesn't work with the wallpaper. 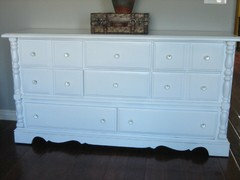 Chest is too Shaker looking and plain to compliment the wallpaper or the headboard. I mean the large chest from your original post. 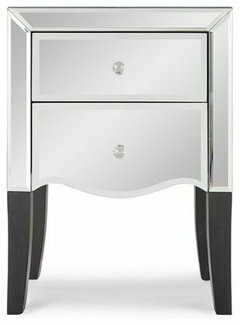 The mirrored side tables are nice but again they don't work with the chest which is just too plain and squared to go with the other furniture. 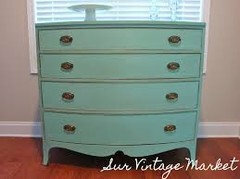 Or should I keep the chest of drawers and change the bedside tables? 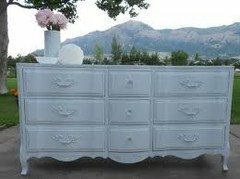 Some examples of dressers that work better with bed and wallpaper. I liked the ones Sarah suggested and the shapes but not the colours (sorry) that leelee suggested. Thank you both. Maybe the best thing is to first place the bed, wallpaper and curtains and then leave the dresser and side tables until last ? Hi jessa61, I wasn't suggusting the colors above for the dresser but simply the style that would work better with your wallpaper. My first thought is that the bed looks a little close to the furniture across from the foot of it. I might try the bed on the window wall and instead of the piece on the wall that has the door, eliminate it and get two bedside table pieces with storage to accommodate whatever you were going to store in the piece across from the foot of the bed in your plan. I like beige and gray schemes in the bedroom too, and find some live green plants add a perfect spot of color, or perhaps a kind of acid green silk texture throw pillow. My suggestion is to browse Houzz photos and save the color schemes that you really love! 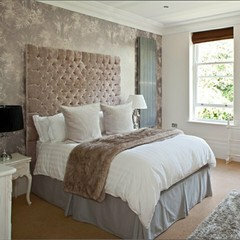 Adding something sparkly will pep up a design that you think is too monochromatic as well - some silver or crystal bling? I added some bling-y chandeliers on either side of the bed in one of my bedrooms, which is fairly monochromatic in beige and gray tones. Some of the throw pillows also have a silvery touch in them. I was wondering what software you are using to create the visuals of how the room could look like using the various elements (wallpaper, carpet, curtains etc.)? Hi Sarah...you've had loads of feedback...i haven't read all of it so sorry if i'm repeating what has already been said. You've definitely had a lot of good advice already. My quick advice would be not to add another colour i.e sage green, it will look too fussy and busy with the wallpaper as well, because the print of that is busy. I would also say its fun to play with scale a bit, you could do this here by adding a large oversized mirror for example. Please help me with decorating my bedroom. 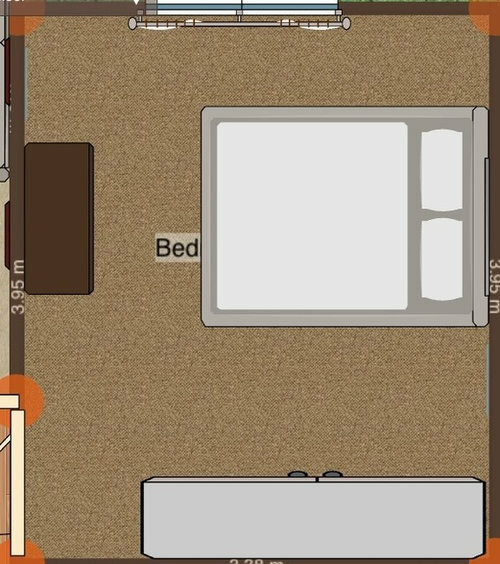 Cannot work a solution for my bedroom layout. Please help! Would it work to paint this chair navy and gold?